The Model CTL-C-129‐P56‐C10‐J1‐T1 shown below is typical and representative of the CTL129 Models. 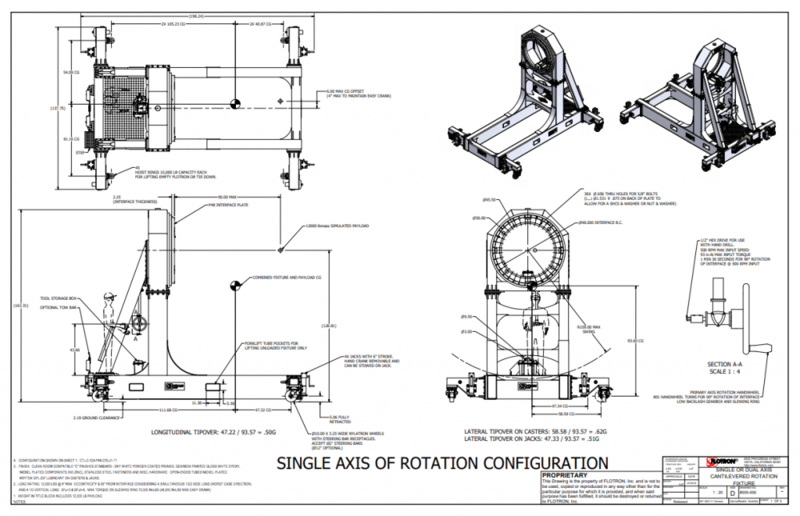 For more information on specifying a cantilevered rotation fixture, see the MID-SIZED SATELLITE FIXTURE OPTIONS page and MID-SIZED SATELLITE FIXTURE CREATING A MODEL NUMBER pdf. Primary Axis Rated Load Capacity: 12,000 lbs. with CG located at 90” from interface plate and 6” from primary axis rotation centerline. Optional Secondary Axis Rated Load Capacity: 7,000 lbs. with CG located at 110” from interface plate and 8” from secondary axis rotation centerline. Payload Interface: Ø56” Circular Interface Plate with 36X through holes for 5/8” fasteners on Ø48” bolt circle. Primary & Secondary Axis Gearbox/Slewing Ring: 3,204:1 total reduction. Inputs can be driven with a hand drill or 12″ diameter hand crank. Finish: Clean room compatible finishes standard. Sky white powder coated frames; gearbox painted gloss white epoxy; nickel plated, black oxide or stainless-steel fasteners and miscellaneous hardware (no zinc). For more about Mid-Size Satellite Fixture Options click here. For Mid-Size Satellite Fixtures – Creating a Model Number pdf click here.